Peter Muhlenberg was a clergyman who became a general in the Revolutionary Army. He was Vice President of Pennsylvania under Benjamin Franklin, and served in Congress. Born: Trappe, Pa. October 1, 1746. Peter Muhlenberg came from a family that loved adventure. His father was Henry Melchior Muhlenberg. He came to America from Germany. He started the Lutheran Church in America. Peter’s mother, Anna Maria, was the daughter of Conrad Weiser. Conrad Weiser was a friend to the Iroquois. He spoke their language. He made treaties between the settlers and the native peoples. John Peter Gabriel Muhlenberg was the oldest child in his family. He was born in Trappe, Pa. on October 1, 1746. He had six younger brothers and sisters. Peter was a quiet boy. He loved to hunt, fish, and explore. Peter loved to read, but he was not a very good student. His father decided to send him to school in Germany. He sent Peter’s two brothers, too. Their names were Frederick and Henry Ernst. Peter and his brothers went by ship to Germany. It took a long time. They went to a school in Halle, Germany. Their father had once worked at that school. Peter’s brothers settled into their new life. Peter did not. The teachers could see that he was not a scholar. They decided to help him learn a trade. Peter was sent to work for a man named Herr Leonhard Niemeyer. Herr Niemeyer had a shop in the town of Lubeck. He promised to teach Peter about running a business. He also promised to teach him about medicine. Herr Niemeyer did not keep his promises. Peter worked hard for him. He worked in the shop every day. He worked for many hours each day. He had only two shirts, and no warm coat. He learned to serve in a shop. He did not learn anything else. Peter’s father and mother did not know that he was unhappy. They did not know that he was not being treated well. When they found out, they asked questions. The people at Halle said that the problem was all Peter’s fault. Peter knew that he must find a way out. He contacted a man named Captain Fiser. Captain Fiser was recruiting soldiers for the British army. They were going to America. Peter asked the Captain to take him home to America. Captain Fiser said that he would help Peter. Peter left the Niemeyer house early one morning. He went to Captain Fiser. He was sworn into the British army. When Herr Niemeyer found out, it was too late. Peter would not come home with him. Peter sailed to America with Captain Fiser’s regiment. When he reached America, he was let out of the army. His father gladly paid for his trip home. Peter’s father sent him to school. He learned bookkeeping. He was not sure what he wanted to do with his life. He thought he might be a doctor, a businessman, or a minister like his father. Provost Wrangle was a Lutheran minister. He offered to teach Peter. Peter learned from him about being a minister. He learned to preach sermons. Soon he was preaching sermons in churches in the area. Peter’s brothers came home from Germany in 1770. They both became ministers. A church in Woodstock, Virginia wrote a letter to Peter. They asked him to be their minister. Some people in the church spoke English. Others spoke German. Peter spoke both languages. It was a good match. Peter accepted the invitation. There was only one problem. The Anglican Church was the official church in the state of Virginia. Peter had to become an Anglican. If he did not, he would not be allowed to do baptisms or weddings. Peter traveled to England. He met with Anglican leaders. They made him a minister in the Anglican Church. Then he returned to America. He sold his furniture, bought a horse, and moved to his new home. Peter was happy in his new job. He made some good friends. He found people who liked to hunt and fish. He may have met George Washington that way. He was interested in politics. He became a magistrate. Peter married Anna Barbara Meyer on November 6, 1770. Everyone called her Hannah. The American colonies belonged to England. England charged high taxes. Some people in Boston rebelled against the high taxes. England punished the people of Boston by closing their port. They could not trade with anyone. The people of Virginia were worried. What if England closed their ports, too? Virginia held a Convention. People talked about the problem. Peter went to the Convention. He represented the people from his county. Peter’s father, Henry, warned him not to take sides. He said that a minister should stay neutral. Peter listened to his father. He resigned from his political jobs. In the next few years, the problems with England grew worse. Peter could not stay out of action. In 1775 he went to a Convention. There they talked about liberty for everyone. Patrick Henry spoke at the meeting. He said, “Give me liberty, or give me death.” Peter wanted to fight for freedom. Peter went to another Convention in 1776. He was made a Colonel in the army. He came home to Woodstock. He had to tell the people in his church what he was going to do. Peter preached a farewell sermon. He said that there is a time to pray and a time to fight. The time had come to fight. He took off his pastor’s robe. Under it was his blue uniform. He stepped outside the church. He asked the men to join him in the army. 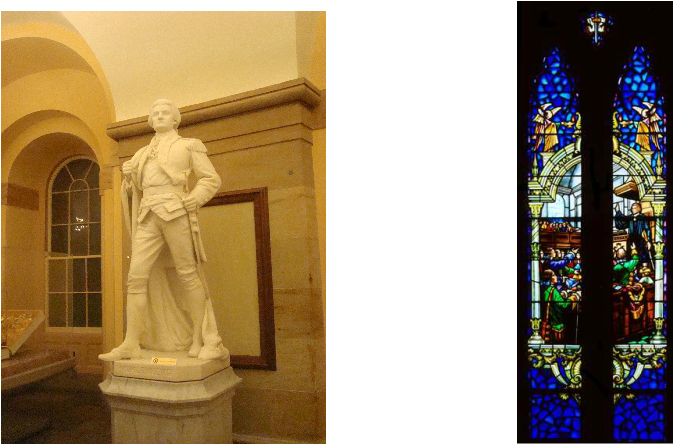 Left: This statue, which stands inStatuary Hall in the Capitol building in Washington D. C. shows Peter Muhlenberg taking off his pastor's robe in preparation for being a soldier. Right: Peter Muhlenberg preaching his last sermon. Stained glass window. Reproduced with permission from Muhlenberg Lutheran Church, Harrisonburg, VA.
Peter was a good officer. General Washington and General Steuben both praised his work. He was faithful and did his job well. Peter and his men were in many battles. They fought at Brandywine, Germantown, Chad’s Ford and Monmouth. During the winter of 1776 Peter and his men were at Valley Forge. This was very near Peter’s family. His wife and child were staying with his parents in Trappe. Peter did not visit them very often. He knew that his visits put his family in danger. Peter did a number of jobs during the war. Sometimes he recruited soldiers. Sometimes he trained them. He became a Brigadier General, and commanded several brigades. These huts are located where Peter Muhlenberg's brigade camped at Valley Forge. At the Battle of Yorktown Peter’s men were in the front lines. They captured an important position. After the battle was over, a report was sent to George Washington. A man named Alexander Hamilton wrote the report. Hamilton took all of the credit for the capture of Yorktown. Peter’s feelings were hurt. He was sick, and he was tired. He went home. Peter became a Major General in September 1783. He retired from the army in November. He also retired from his church. He took his family back to Pennsylvania. The German people in Pennsylvania welcomed Peter Muhlenberg warmly. To them he was a hero, like George Washington. 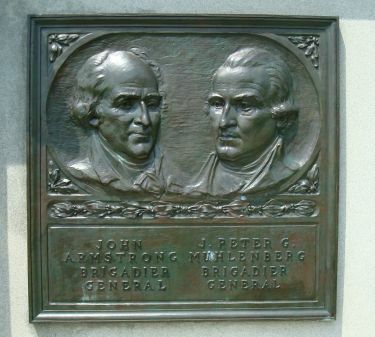 A memorial to Peter Muhlenberg and John Armstrong, two Brigadier Generals whoserved under George Washington at Valley Forge. Virginia rewarded Peter for his good work. He was granted some land in Ohio. Peter was restless. He was not used to sitting still. He decided to go to Virginia to see the land. He thought he might move there. Peter went to Ohio. It was a long, hard trip. He traveled by horse and by flat-bottomed boat. He reached Louisville in Ohio. He found that the land was not free. It belonged to the Native Americans who lived there. They did not want people to settle on their land. Peter came home to Pennsylvania. He told Congress to make a treaty with the Native Americans. Then they could settle land in Ohio. Benjamin Franklin was elected President of Pennsylvania in 1787. Peter Muhlenberg was elected Vice President. Benjamin Franklin was in poor health. Peter took over many of his duties. George Washington became President in 1789. Peter Muhlenberg joined the Congress. He went to the first, third, sixth, and seventh sessions of Congress. He never made a single speech. Peter was tall and handsome. He was a hero from the war. Many people liked him. Some people asked him to run for Governor of Pennsylvania. Peter said no. He was tired of politics. Peter still had his army job. He was a Major General. He was in charge of troops from Montgomery and Bucks counties. In 1801 Peter took a job as Supervisor of Customs. When he took this job, he resigned from the army. In 1803 Peter took a new job. He became the Collector of the Port of Philadelphia. He bought some land on the Schuylkill River. There was good fishing there. Peter’s wife Hannah became sick. She was sick for a long time. Each night Peter sat by her bed. Hannah died in October 1806. Peter was very tired. He had a problem with his liver. He died one year later, on October 1, 1807. It was his 61st birthday. There is a Peter Muhlenberg Middle School in Woodstock, Virginia. Muhlenberg Lutheran Church in Harrisonburg, Virginia is named in honor of Peter Muhlenberg. In Washington D.C. there is a statue of Peter Muhlenberg. It stands in Statuary Hall. See picture above. There is a Brigade Marker at Valley Forge. It marks the Muhlenberg Brigade. Left: Brigade Marker detail. Right: Peter Muhlenberg's name is also listed on the Nationa Memorial Arch at Valley Forge State Park. Muhlenberg College, in Allentown, Pennsylvania, is named for Peter’s father, Henry Melchior Muhlenberg. In the Martin Art Gallery on the college campus there is a portrait of Peter Muhlenberg. Reading Level 4.9. Photographs by M and T. Yates. Portrait of Peter Muhlenberg reproduced with permission from the Martin Art Gallery, Muhlenberg College, Allentown Pa.